When you’re purchasing a truck scale, there are many different items and costs to consider. So, any costs that you can possibly reduce can make a substantial difference. One area to consider is the cost of the digital weight indicator. The odds are if you’re putting in a new truck scale, you will probably be quoted an indicator that is the same brand as the truck scale you’re buying. 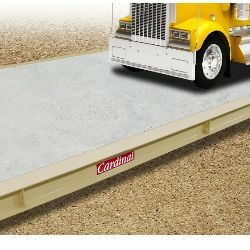 For example, if you’re looking to buy a Cardinal Armor “EPR” truck scale, you will probably be quoted a Cardinal 225 weight indicator. If you’re looking at a Rice Lake ATV truck scale, you will probably be quoted a Rice Lake 720i weight readout. These indicators are nice and will do an outstanding job for you. But, they can be a little pricey. An alternative choice that you might want to consider is the Pennsylvania 7600E which in some cases could save you $500 or more. 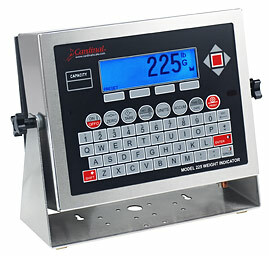 The Pennsylvania 7600E Indicator is IDEAL for TRUCK SCALE, Heavy Capacity, and BATCHING applications with convenient I/O connections and Menu Driven batching sequences or 300 Truck Tare memories with menu-selected Print Sequences. It was designed for expanded capabilities (using the PLUS+ Series Main Board) and is a DIRECT EXCHANGE REPLACEMENT indicator for thousands of similar units presently in use. Simplified 5-Button front panel model has all of the features and capabilities of the 7600E but is designed for direct replacement for many existing UMC600 or IQ700 series applications; dual independent RS-232 outputs, for example drive both scoreboard / remote display and ticket printer. POWER & FLEXIBILITY– The 7600E adapts to the most demanding applications with a wide range of outputs, options, and features. No need for expensive programming or expensive set-up. The 7600E is one of the easiest to use, easiest to install, easiest to live with indicators available today! TRUCK SCALE APPLICATIONS: 300 Tare Weight memories and IN/OUT program plus menu-selectable ticket formats make the 7600E the obvious choice. 10 point linearization and tweak mode for calibrating convenience. Two separate digital outputs for printers and scoreboards plus optional relay alarms for truck-on-scale, overload warnings and more. expandable for future requirements. SS enclosure with convenient U-Bracket mount. IDEAL REPLACEMENT INDICATOR—grams to tons, designed specifically for fast, seamless installation in a wide variety of replacement applications as well as new installations. So when you’re looking to put in a new truck scale, one of the easy ways to save a few bucks is to go with a less expensive digital weight indicator like the Pennsylvania 7600E, which is made in America by the way.